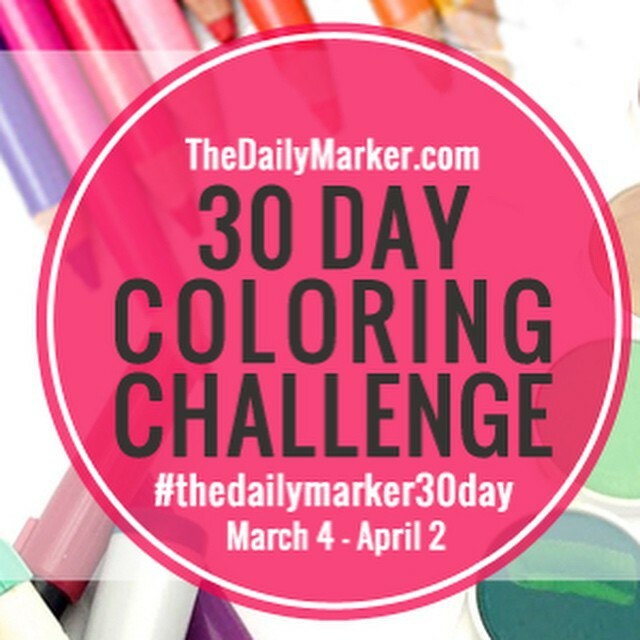 From March 4 to April 2, I’m participating in The Daily Marker 30 Day Coloring Challenge (details here). Every day, I’m coloring *something*, even if it’s just for 5 minutes, and I intend to have a few works in-progress throughout the challenge. You can follow along on Instagram via #thedailymarker30day, and you can find my efforts there under my username saffronkingfisher . 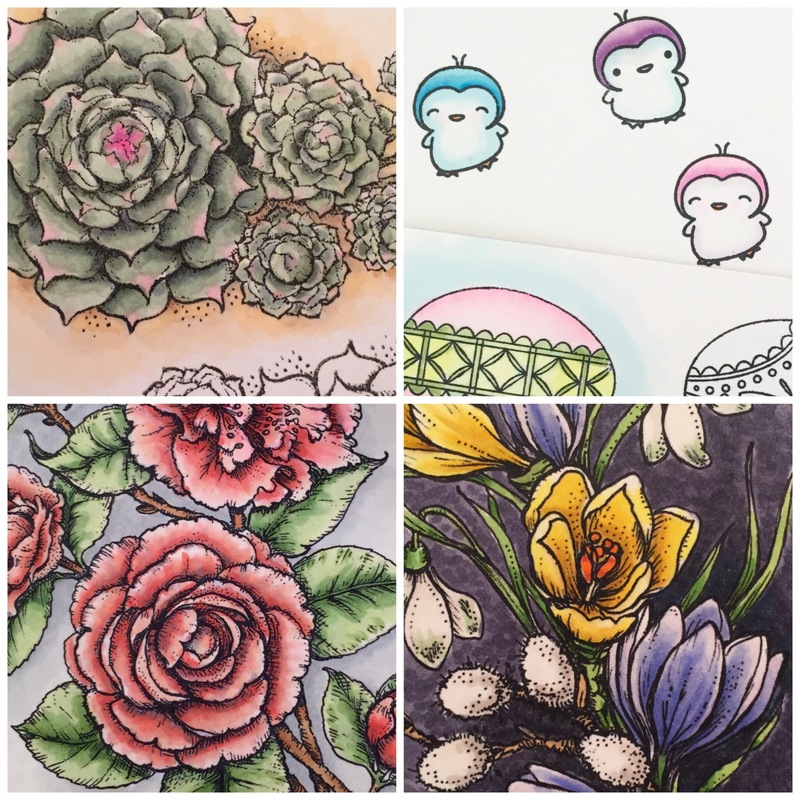 If you want to get coloring, it’s never too late to jump in! I’m down to the wire, but here is my entry for Power Poppy’s THE SKY IS THE LIMIT challenge. Here is my inspiration photo, taken by me, with an iPhone, no filters. 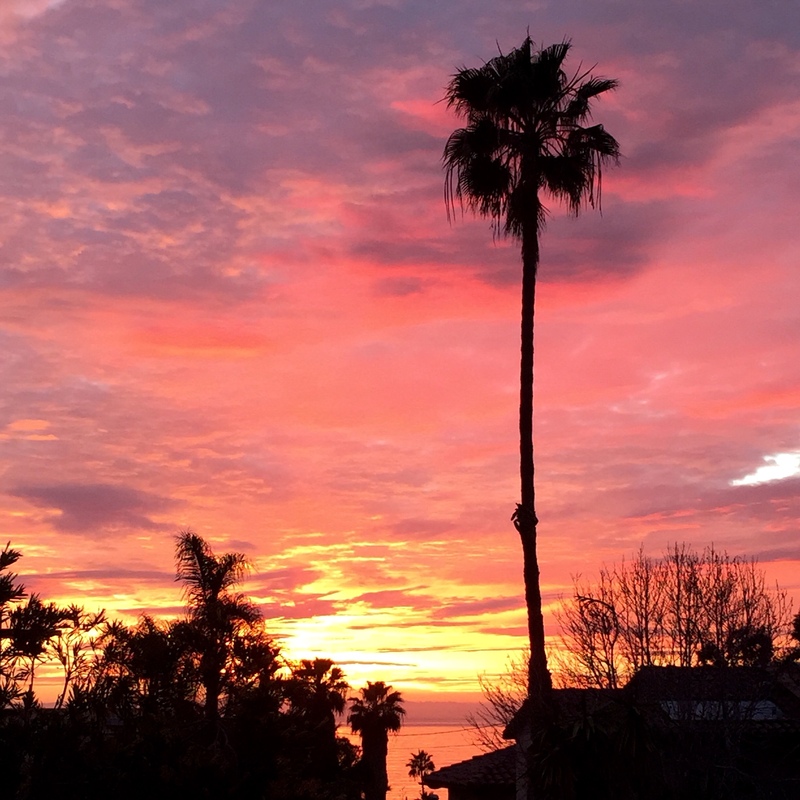 I live in SoCal, and winter is when we get spectacular sunsets. Sometimes the sky is lavender, and sometimes it is neon with the last glow of the sun. I decided to go bold with my entry, showing off the amazing hues of my sunset. I haven’t seen the sky go green yet, but I think it sets off those pink, oranges and purples so well. 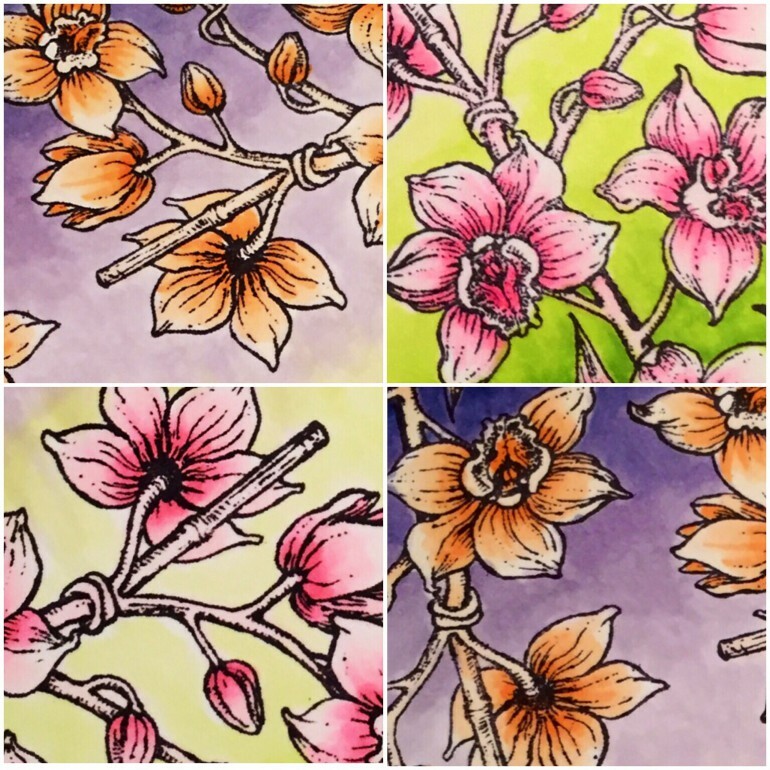 I stamped multiple images from the Orchids Rock set, to create a sort of pattern. This card is another step away from a realistic style of coloring, but I really like playing with these images in new ways. One technique I used a lot of this time was tip-to-tip blending. 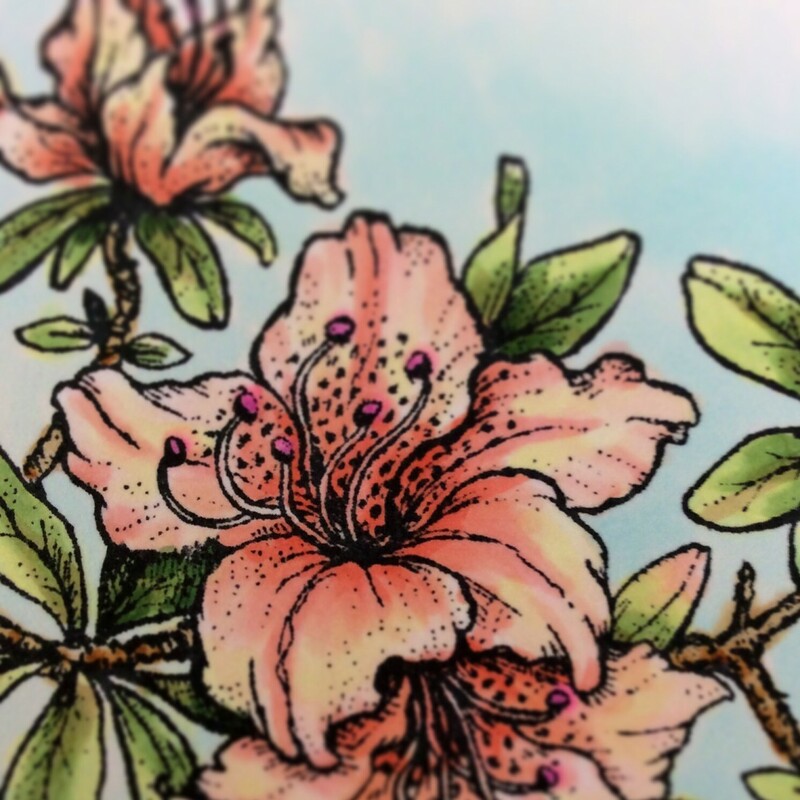 For both the background and the flowers, I either needed a marker I didn’t have, or needed to “invent” a new color. I’m definitely still learning, but I’m glad for the practice. 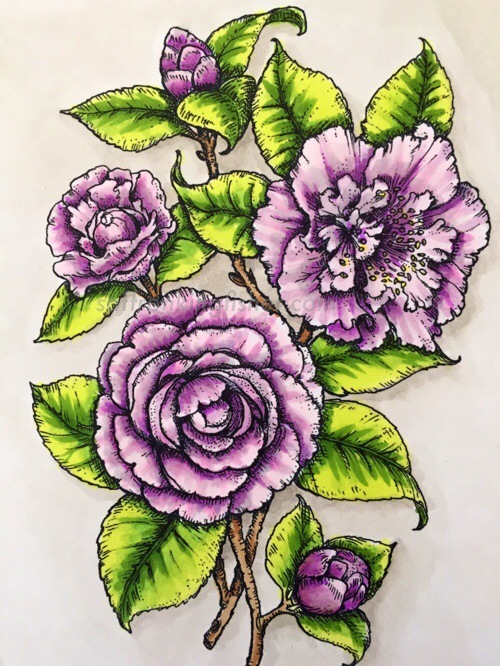 My mom is an artsy lady who likes to paint with watercolors. When her birthday comes around, I always try to make her something pretty and creative, or perhaps show her a new technique I’ve learned. 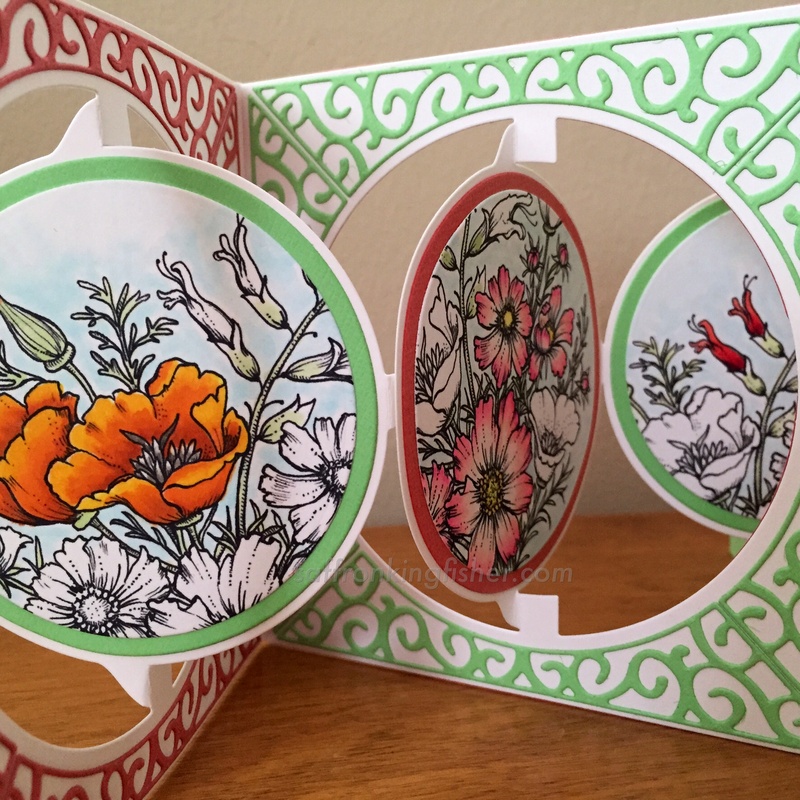 I think these accordion card dies from Karen Burniston are so cool! 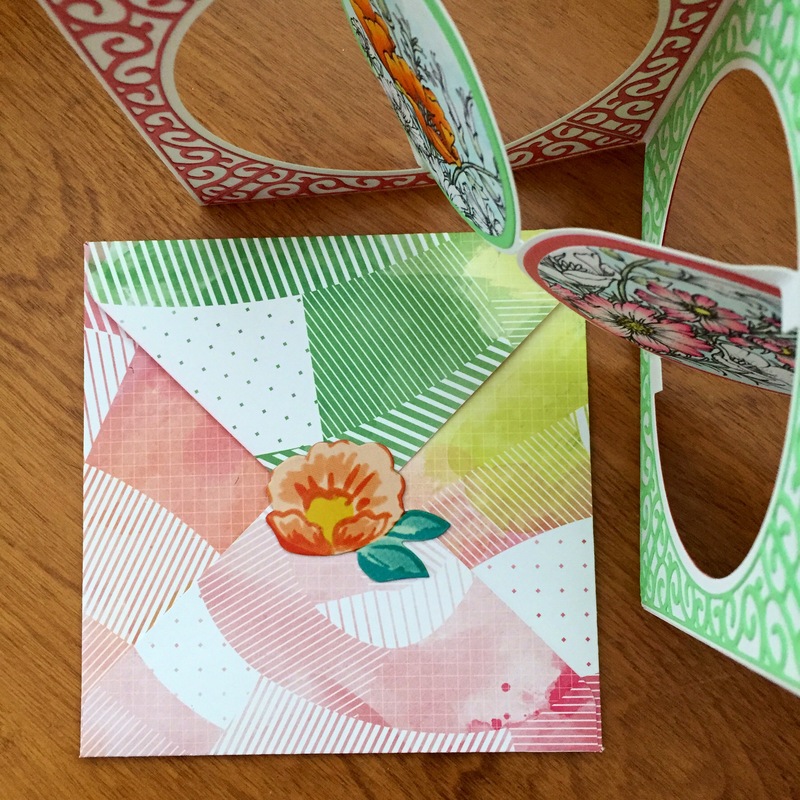 They’re easy to put together, and the finished card looks so impressive. 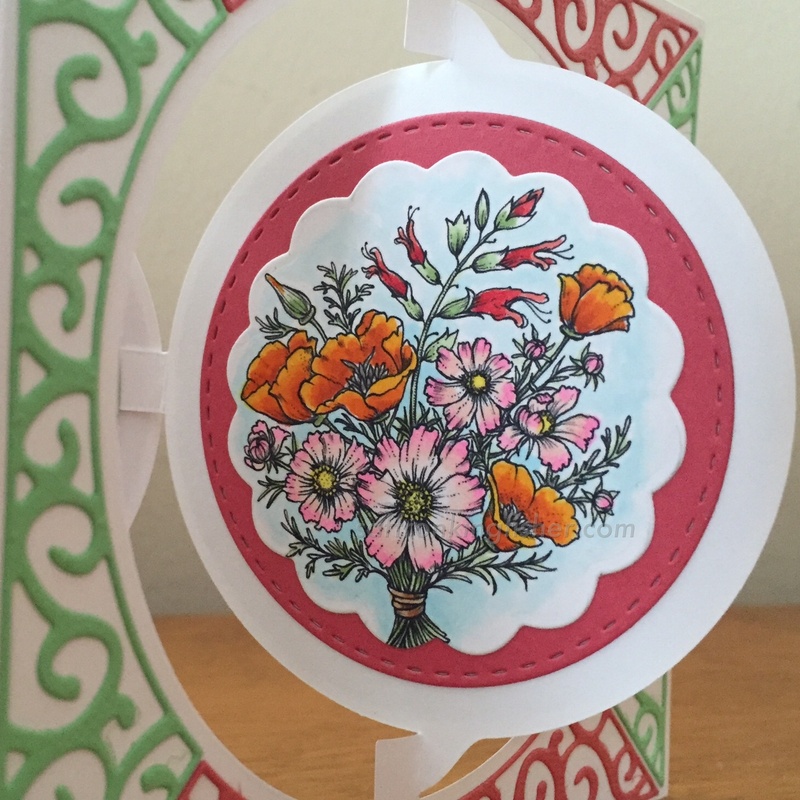 You can learn more about the dies and assembling the cards from Karen Burniston herself in this video. 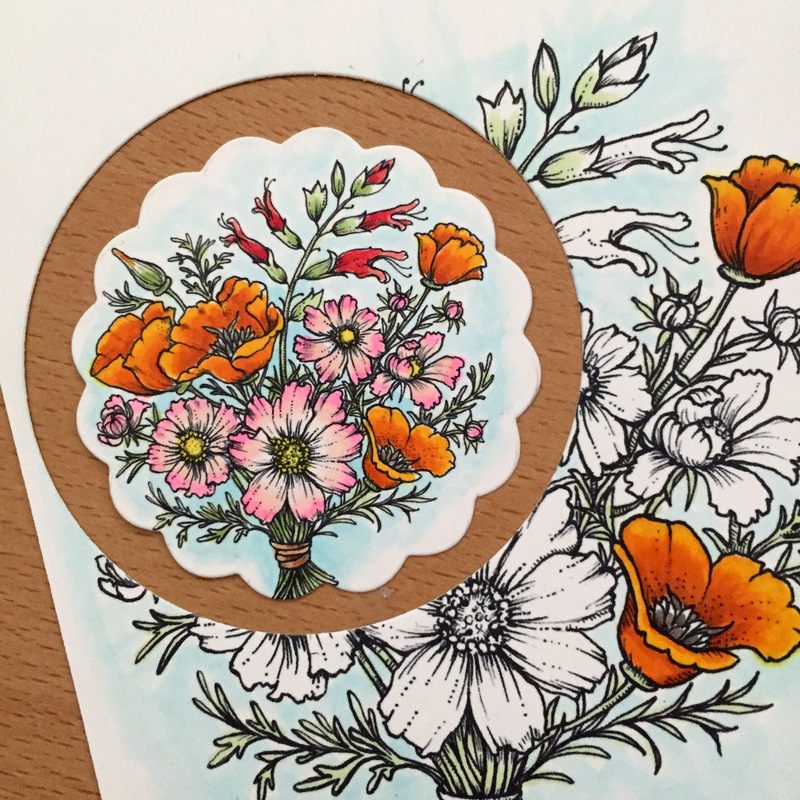 For this years birthday, I used the Countryside Bouquet digital stamp from Power Poppy. 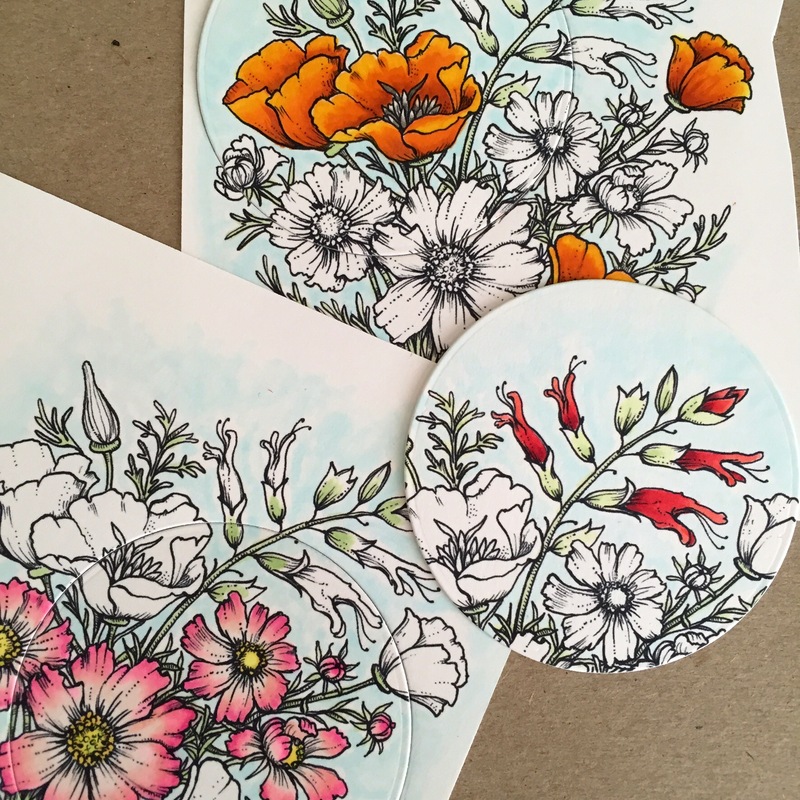 For each of the three main panels, I colored just the Coreopsis, or just the California poppy, or just the Salvia in the bouquet. 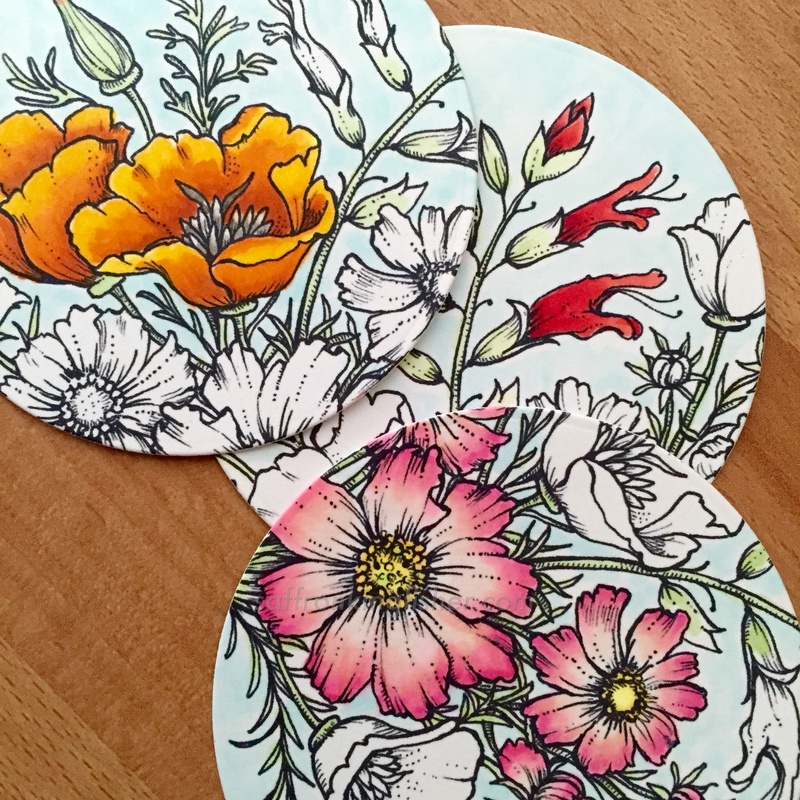 On the back of the of one of the panels, I included a small version of the bouquet, with all three flowers colored. 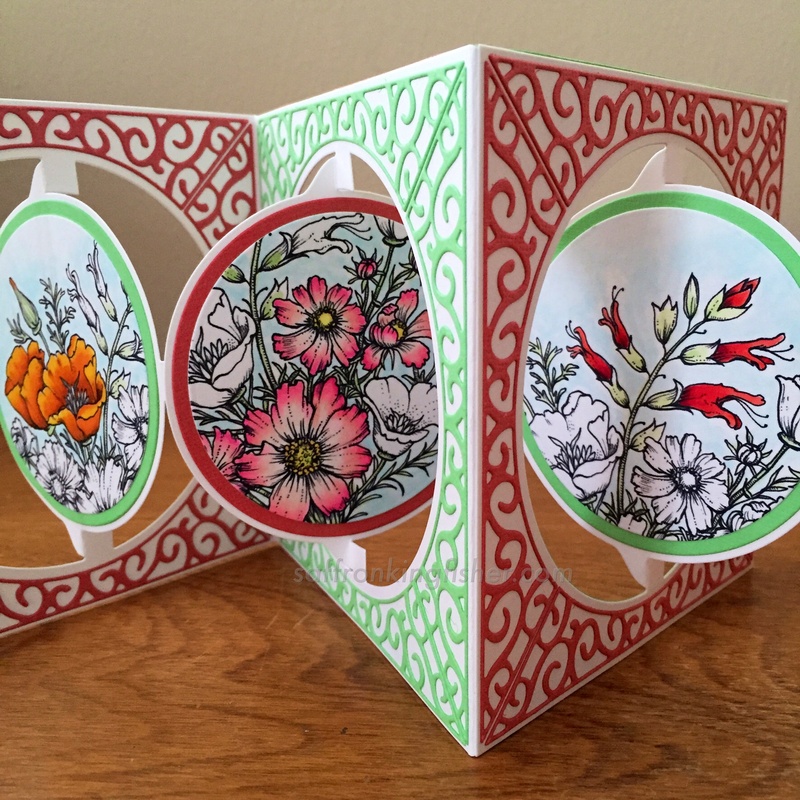 I wanted to add some trim pieces around the edges, and I chose flourish edges from the Frame Edges die set. I cut 16 of these edges to go around the panels of my card. 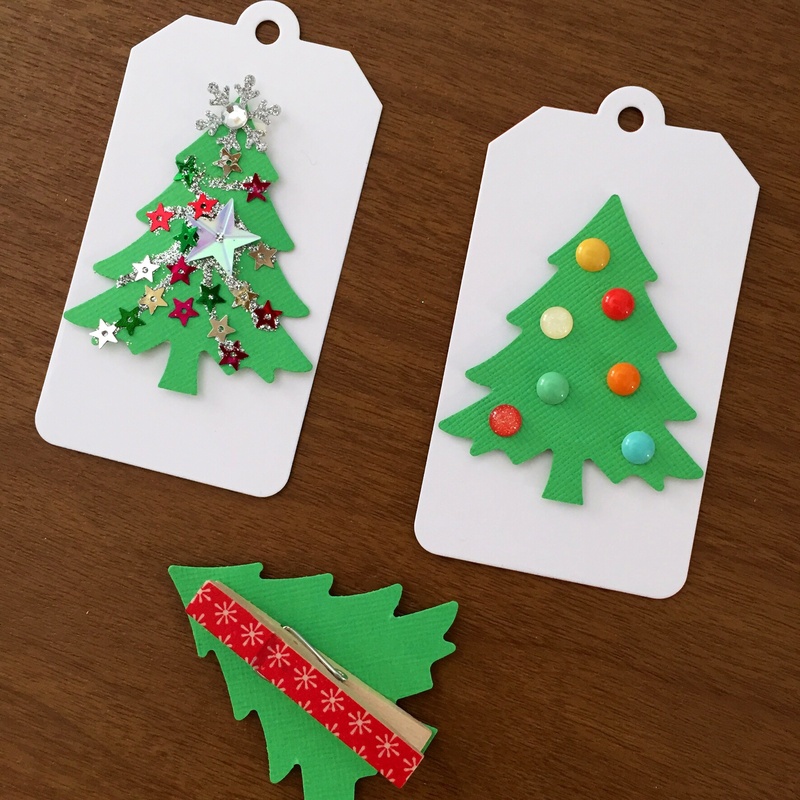 A tip for cutting out these pieces: run strips of paper through your xyron before cutting, and you will get a perfectly cut, perfectly sticky trim piece, with no extra adhesive clinging to the edges, and no trying to glue down tiny swirls of paper! After I got the trim pieces placed on my card, I ran a clean brayer over them to make sure they were stuck down securely. 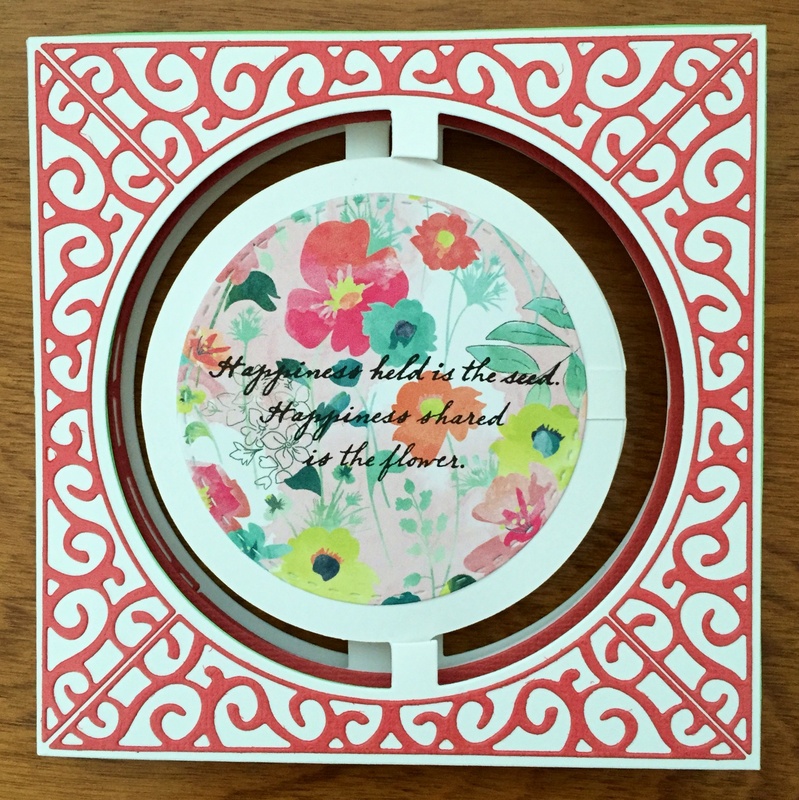 I used a combination of dies from the accordion card set and other circle dies to cut out my colored images and backgrounds. I once I assembled the panels, I added some additions to the back, such as a sentiment (not shown) and this sweet quote, stamped on some Basic Grey Fresh Cut Paper. 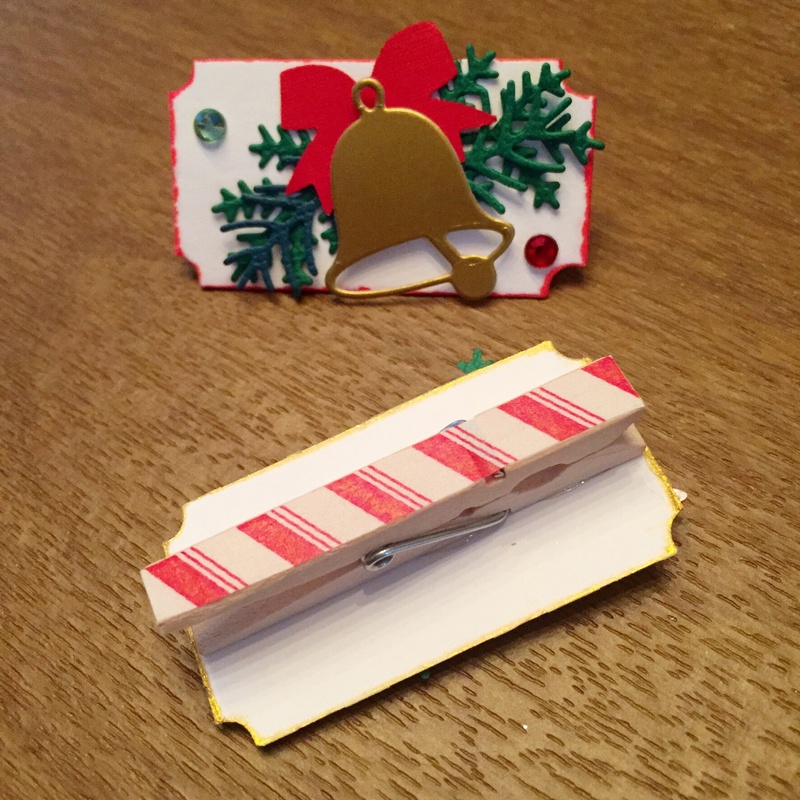 I also made a custom envelope, using more Fresh Cut paper and my WRMK envelope punch board. You can see the finished card in motion on my Instagram. I’m back with some more tags. 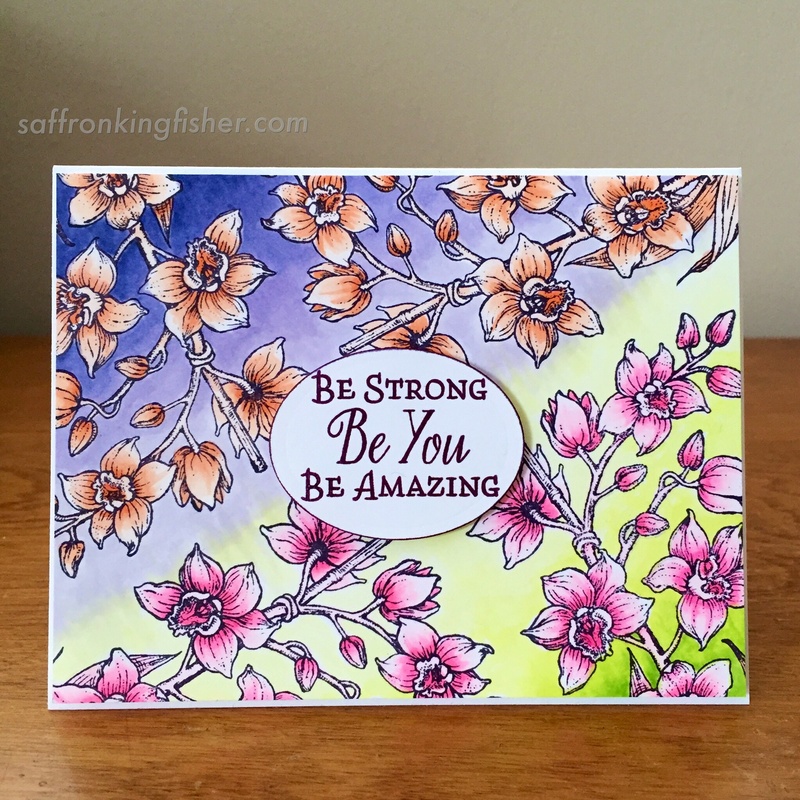 Previously, the Power Poppy blog has inspired me to deconstruct those gorgeous floral images, and it may be my favorite twist on the usual stamped and colored card. 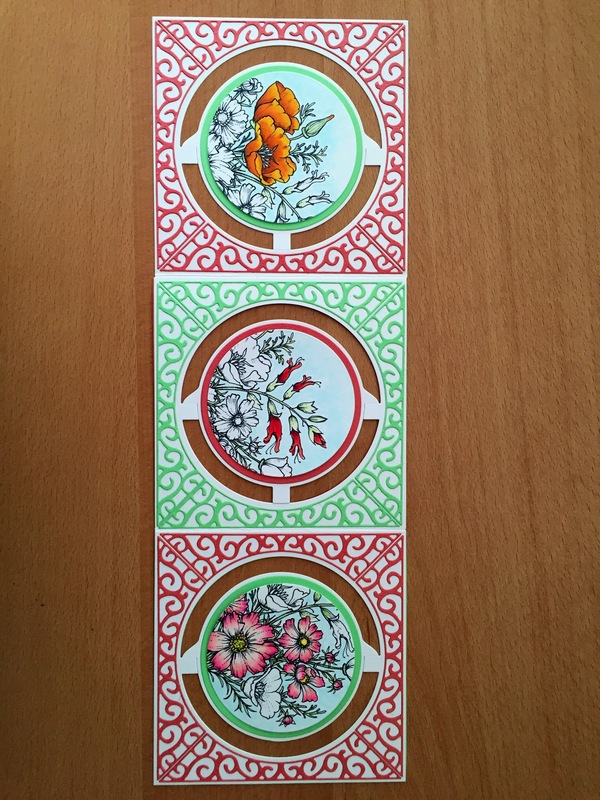 This time, I printed and colored the Camellias digi stamp. I was experimenting with shading some acid green leaves, and the finished image turned out *really* vivid! 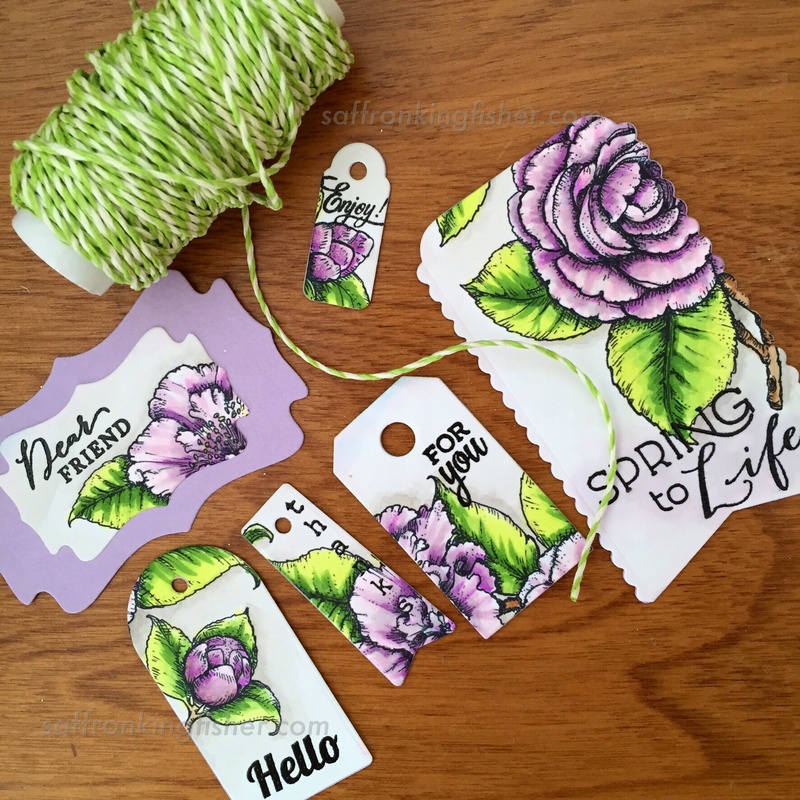 I decided that maybe the flowers would be most effective in small doses, so I die cut a slew of tags. I backed all of them with lavender card stock, and then stamped and heat-embossed small sentiments on each. 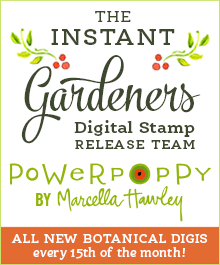 Several of the Power Poppy stamp sets have a perfect, tiny “For You” that’s just perfect for a gift tag. 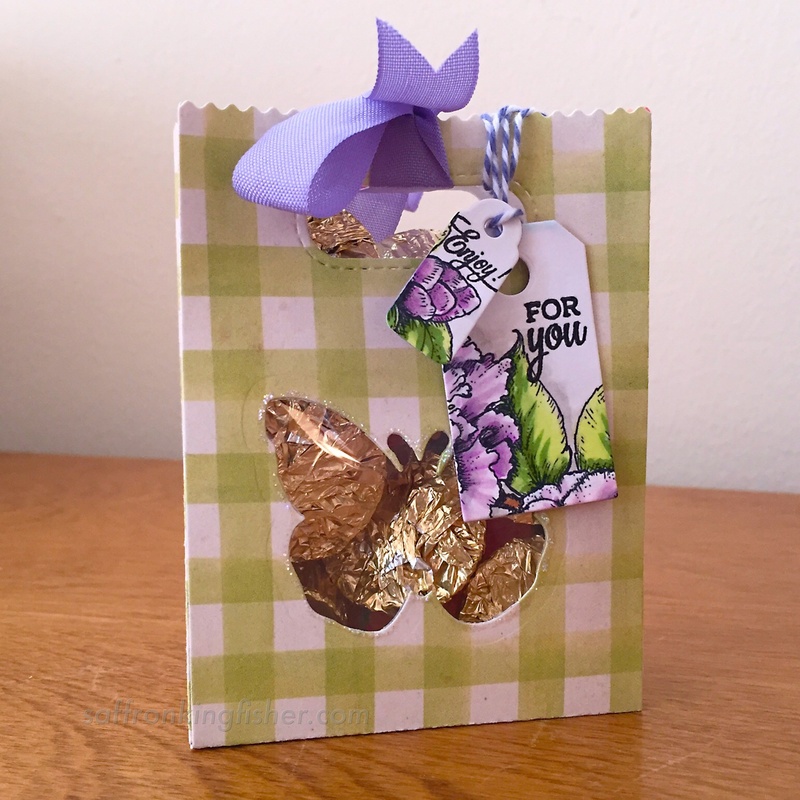 My newly-crafted tags inspired me to make this little gift bag for my friend Dani, who gifted me a couple of ink pads. 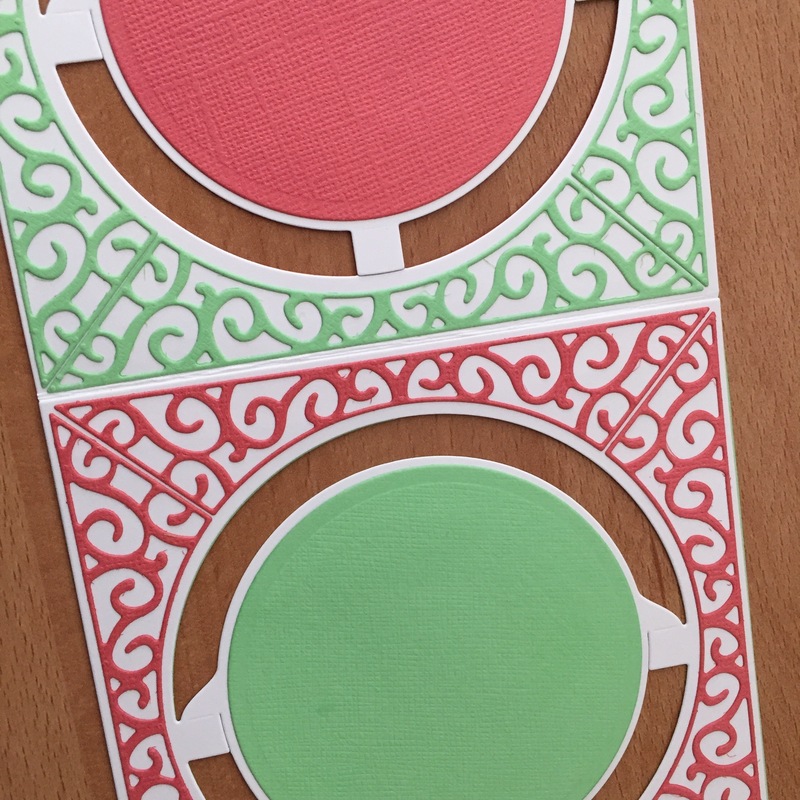 I cut the bag pieces from card stock that is a much brighter light green in real life! 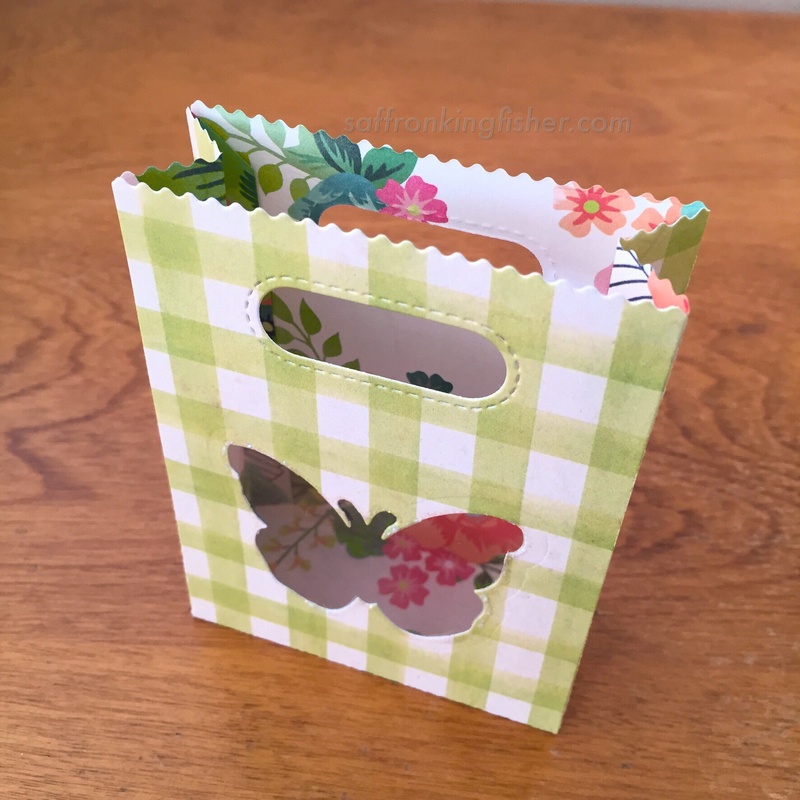 Then I die cut a butterfly, outlined the shape with stickles, added some acetate for backing, and assembled the bag. I filled it with some Speculoos-filled chocolate cups from Trader Joes, and tied the top with some lavender seam binding. I tied my tags together with twine and then attached them to the bag. I think it looks very springy! It’s Never Too Late For Tags! Hi there! 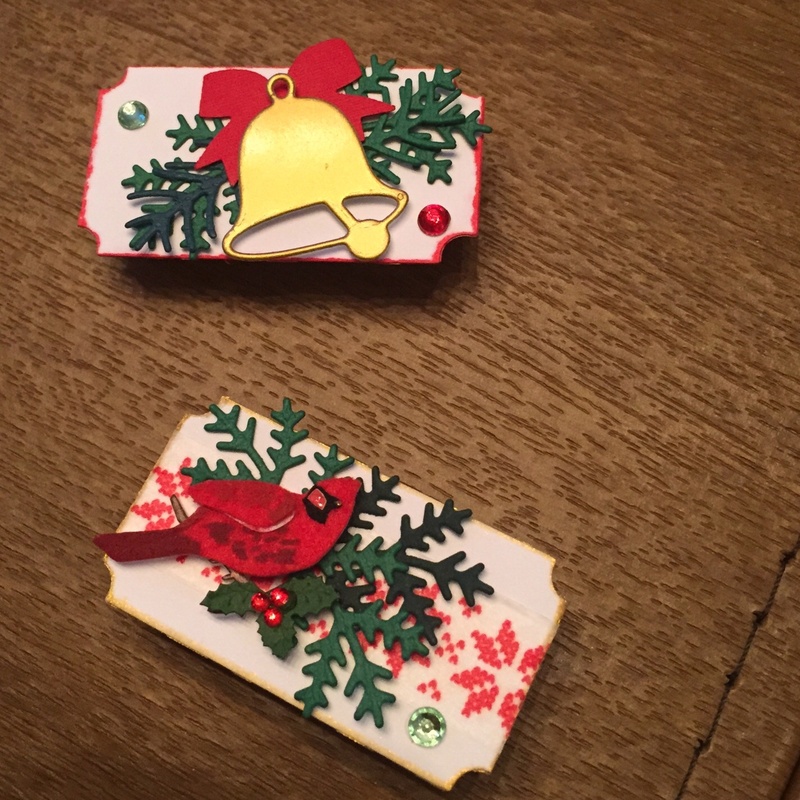 I had grand plans to write several blog posts about my Christmas crafting, but then I caught a bug over Thanksgiving that has really thrown a wrench into those plans! 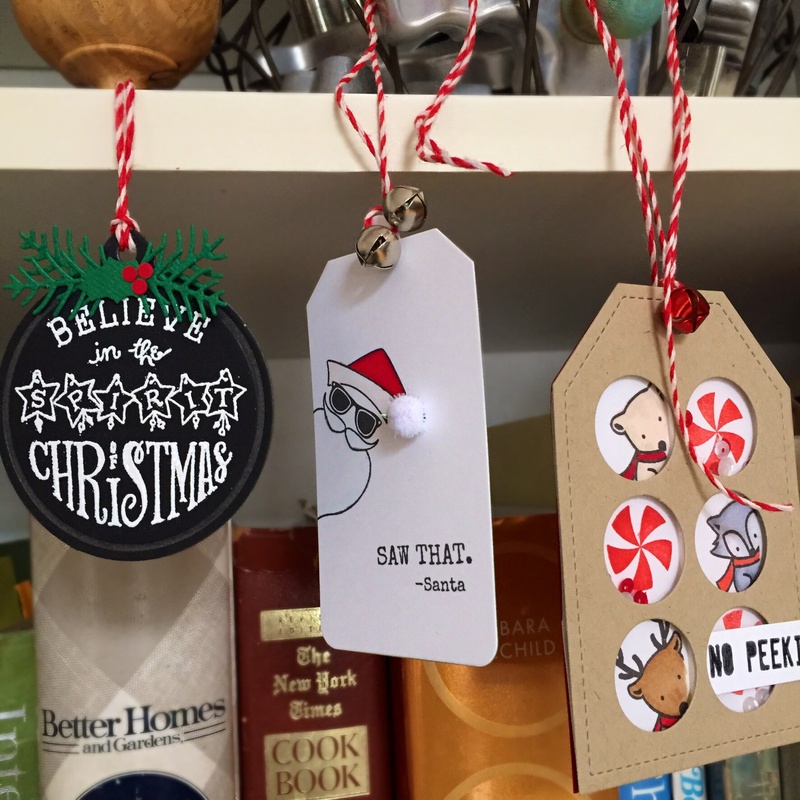 However, I’ve really enjoyed making all sorts of tags this season, and I thought I’d share those with you. The tag on the left is my take on the chalkboard trend. I heat embossed (with white powder) a sentiment from Power Poppy’s Joyful Arrangement Stamp set onto a a die-cut tag from Papertrey Ink. I couldn’t believe how perfectly everything fit! 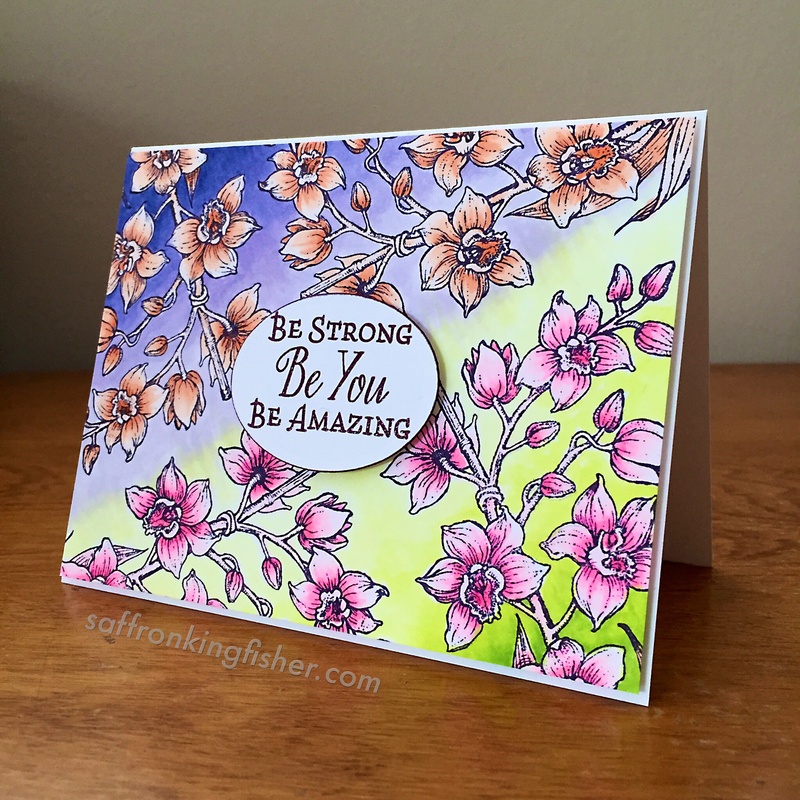 I added some sweet greenery cut with Impression Obsession dies. The candy-striped twine is by Lawn Fawn. 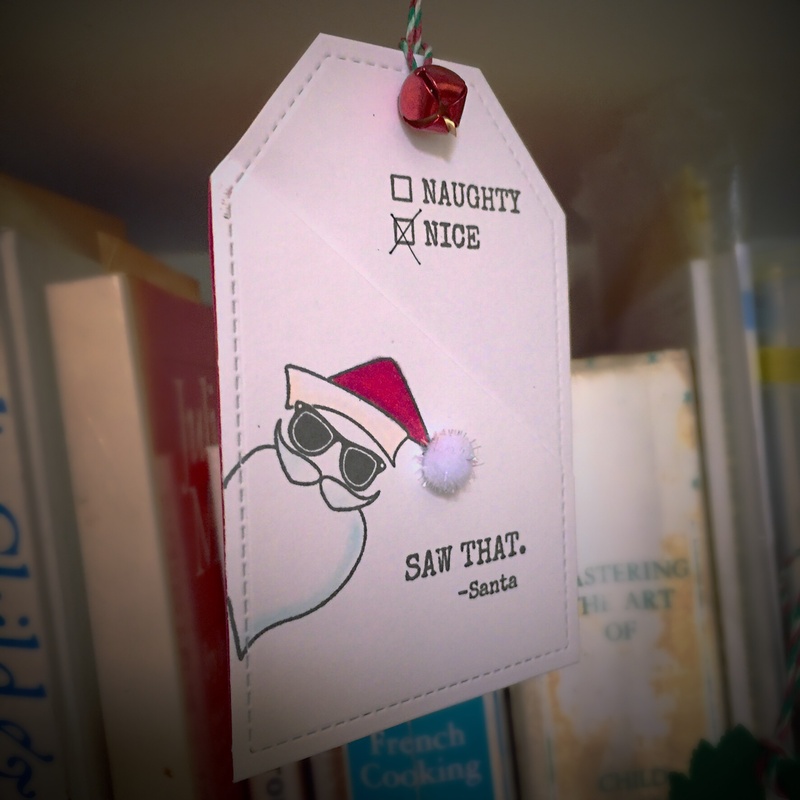 The center tag uses that great cool santa from Ellen Huston’s Tis the Season stamp set. 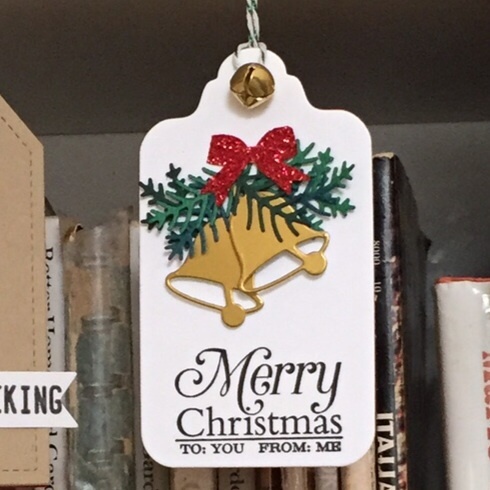 A little copic coloring, a pom-pom and a few jingles bells finished this tag off. I’ve got a variation on this tag further down the post. 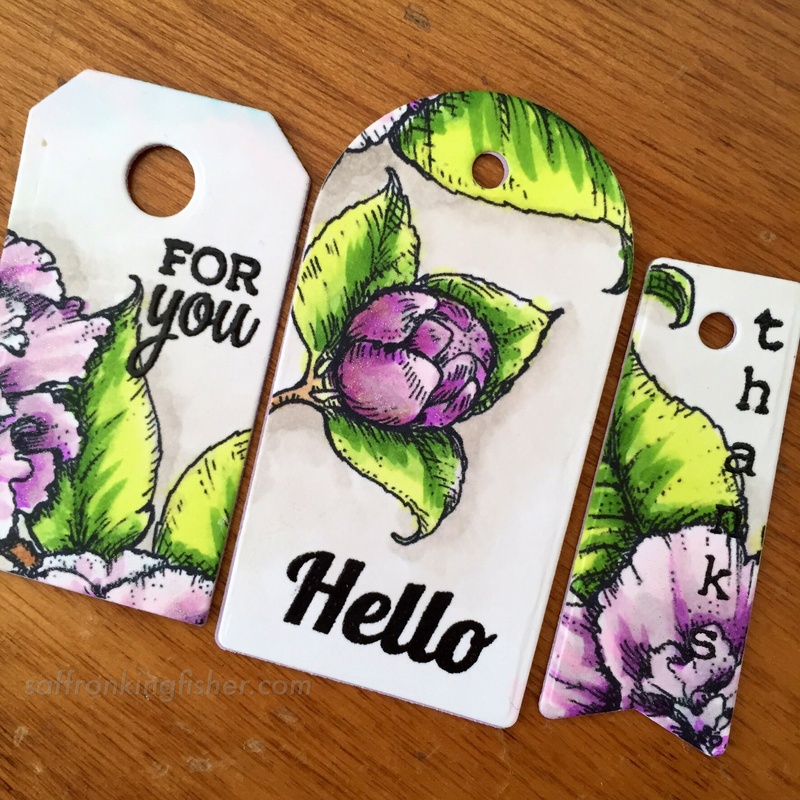 The right-hand tag is my CASE of Nichol McGuirk’s super cute No Peeking tag, using Mama Elephant stamps and Pretty Pink Posh dies and sequins. I really enjoyed making these ticket tags! 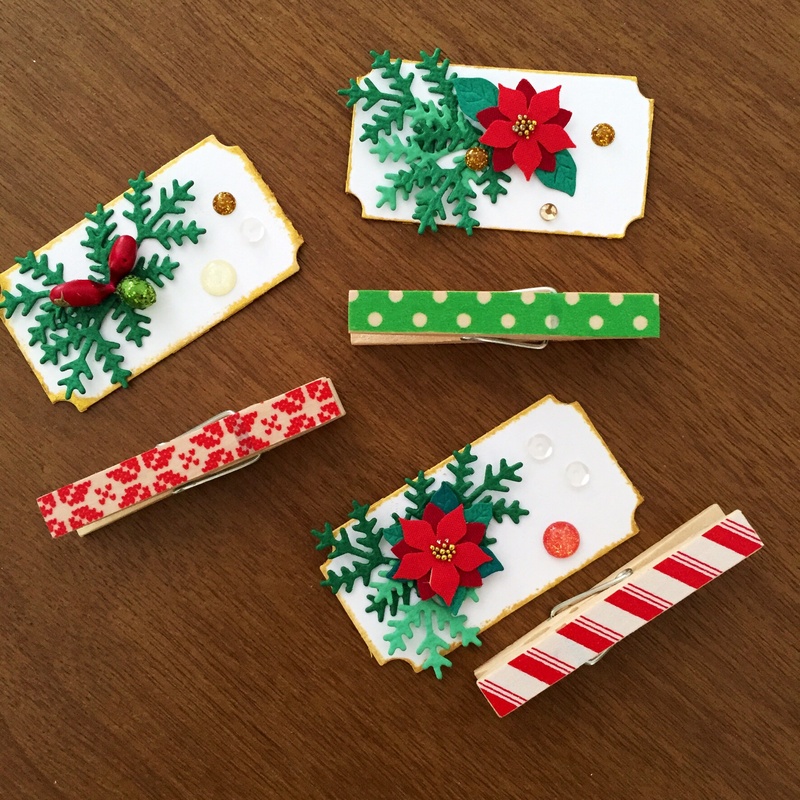 Instead of making punching holes and using twine, I decorated some small clothespins (washi tape, super easy) and used those for attaching my tickets. 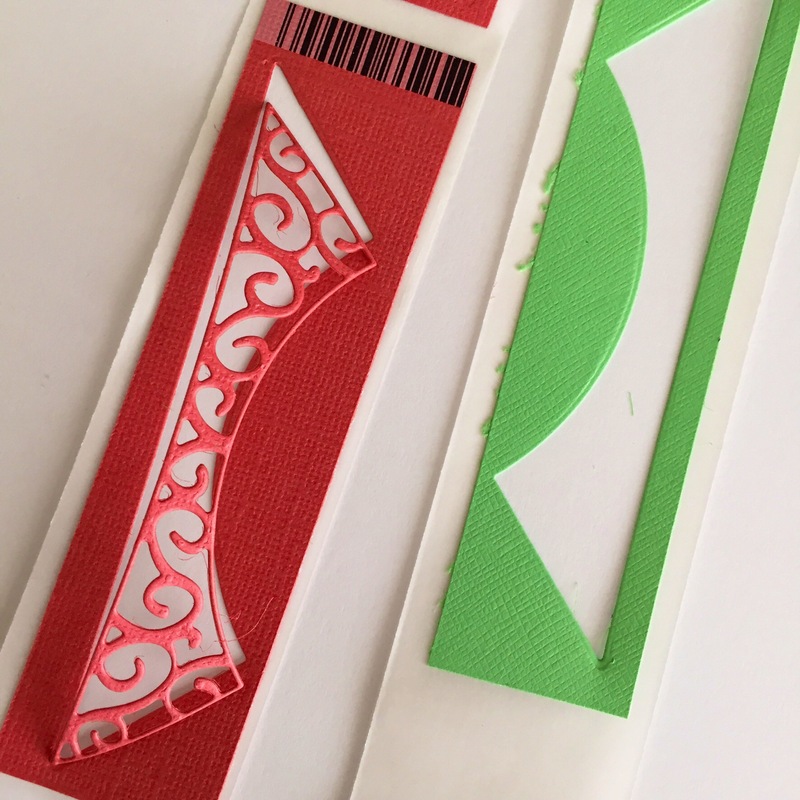 These tickets are only 2″ long, so tiny die cuts, gems and stickers look right at home. Here’s that santa again, but this time the tag has a built-in pocket (I know it’s hard to see!). I made this pocket tag by die cutting a folded piece of card stock, with the left edge of the die just off of that fold when I ran it through my Big Shot. I secured the edges of the tag with 1/8″ Scor-tape, and it will juuuuust fit a gift card in that pocket, so using strong adhesive is key. 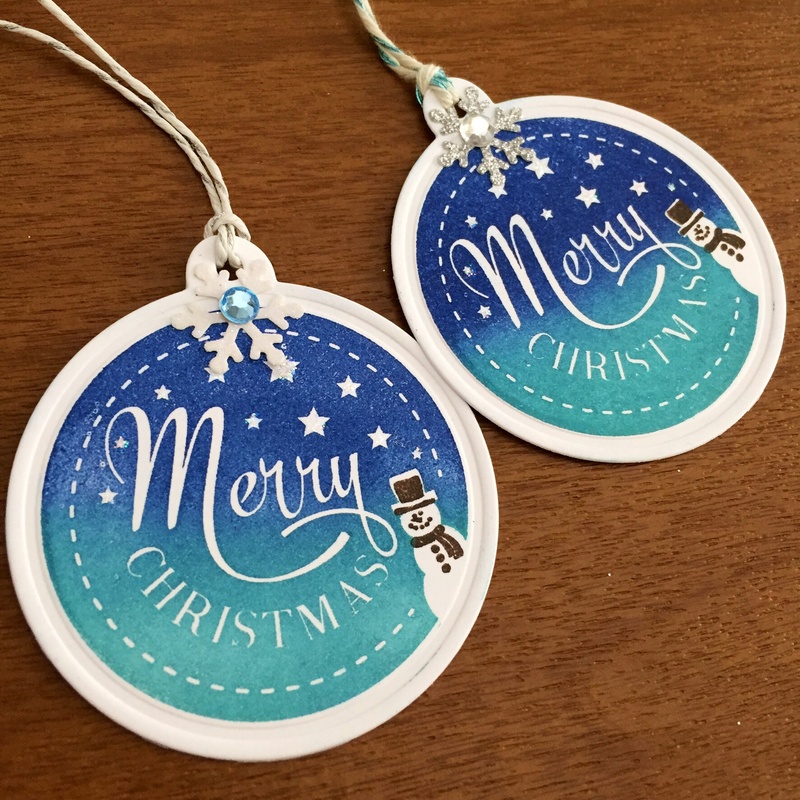 These round tags use stamps and a die from Papertrey Ink’s Tinsel and Tags kit. I created an ombre look with Avery Elle pigment inks. 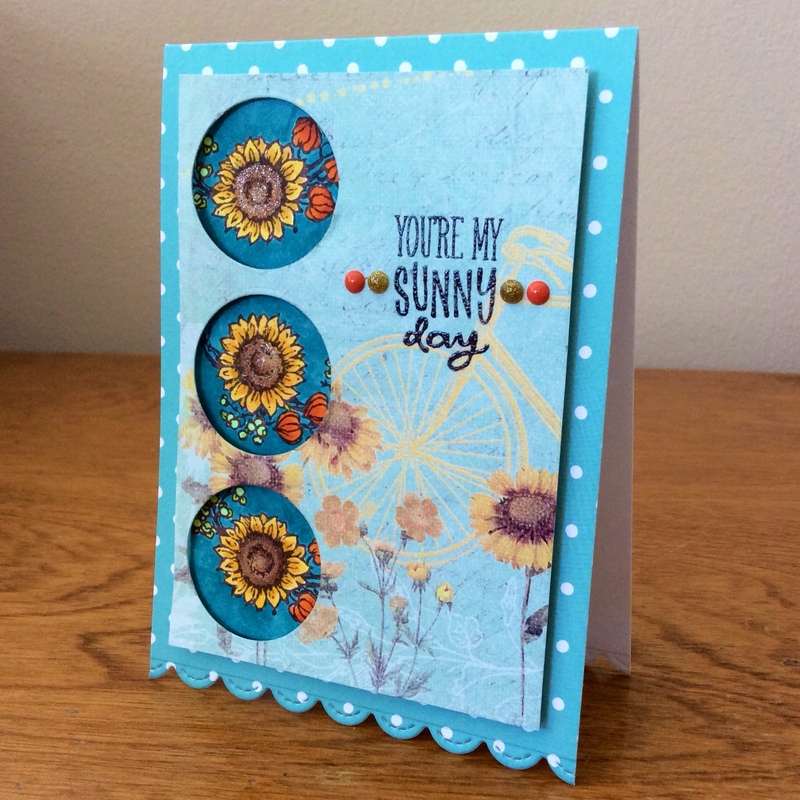 This is my latest Peep of the Week entry, and this card was also a prototype for my entry in the Pop Goes the World challenge, as I was experimenting with repeating sunflower and circle designs. At the same time, I decided to try a neat technique for making DIY embellishments. I had made a few “epoxy” blanks already (the secret is glossy accents and acetate! 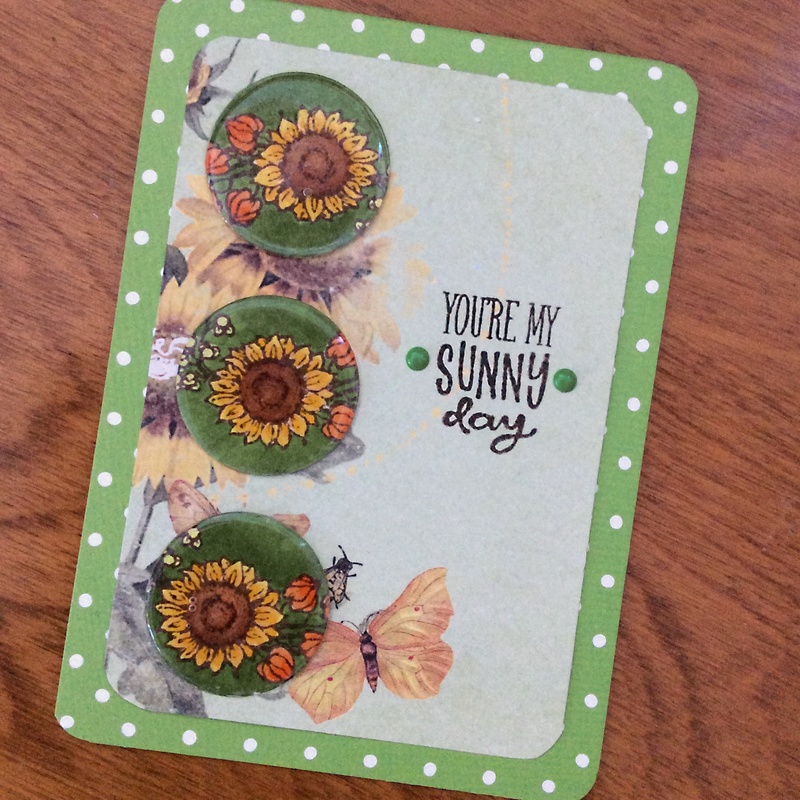 ), so I stamped three sunflower sprays, colored them with copics and then die cut matching shapes. 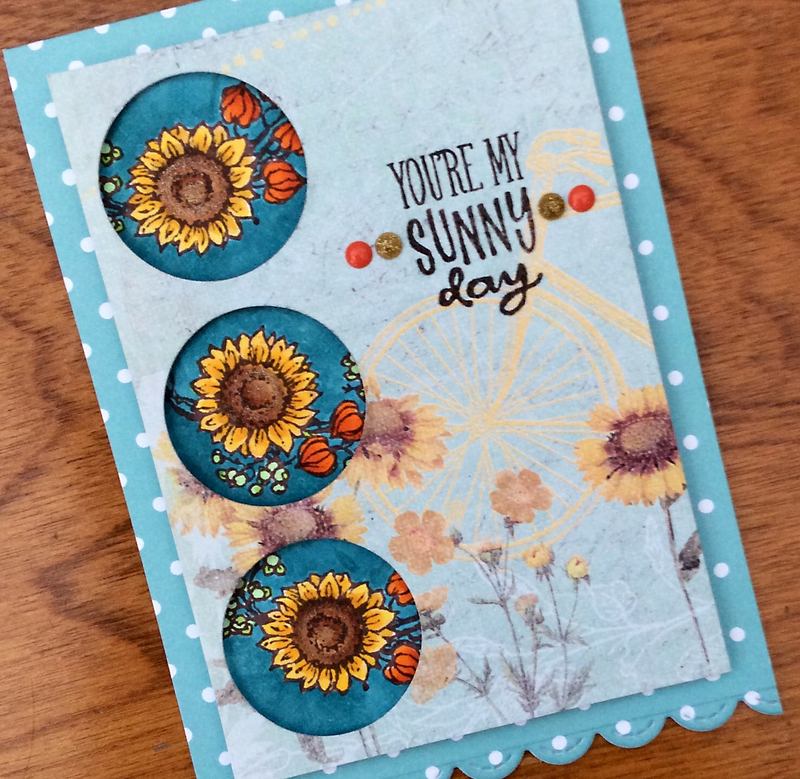 To finish my Sunny Harvest “flair,” I adhered the sunflowery circles to the blanks. 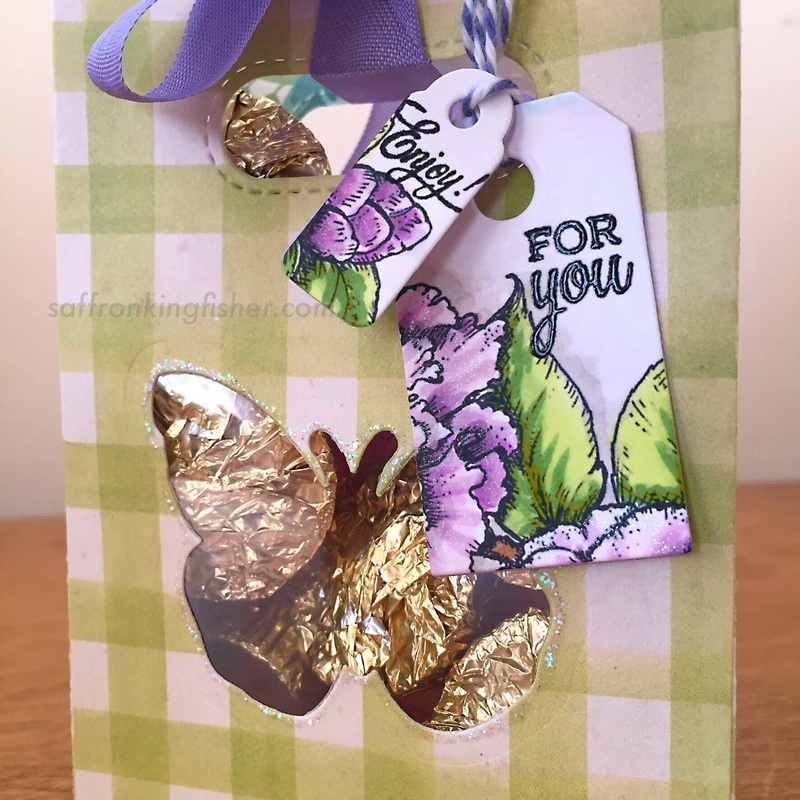 I used three of these embellishments to create a card with raised elements. 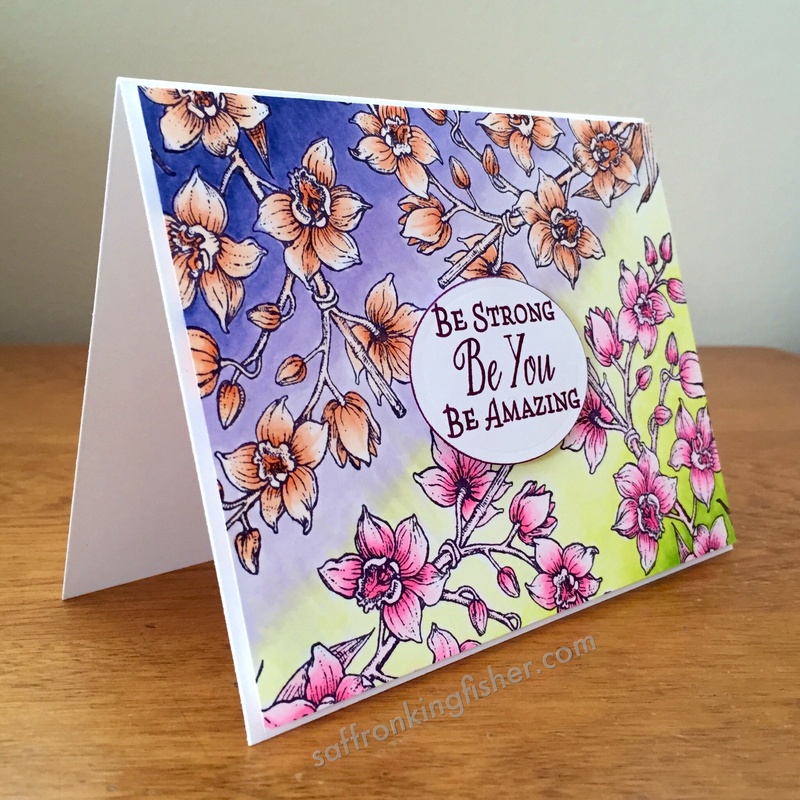 I coordinated the background of the flair with the pattered paper, enamel dots around the sentiment, and the polka-dotted card base. 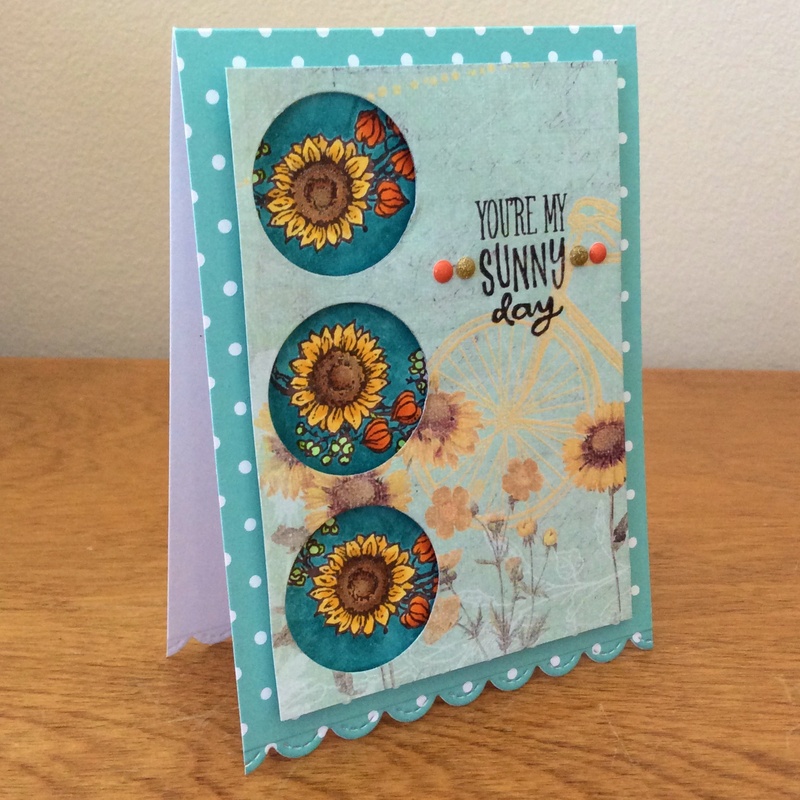 My entry for the Power Poppy August Pop Goes the World challenge uses the sunflowers from the Sunny Harvest stamp set. 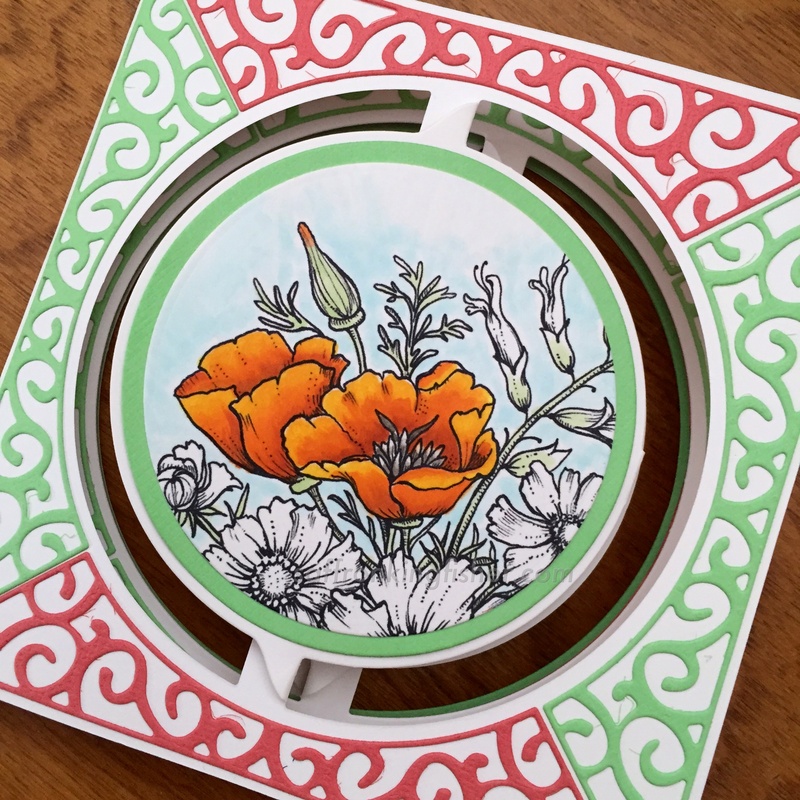 This month’s challenge had a color requirement—to use at least three of the following colors: turquoise, buttery yellow, rusty red, and grassy green. 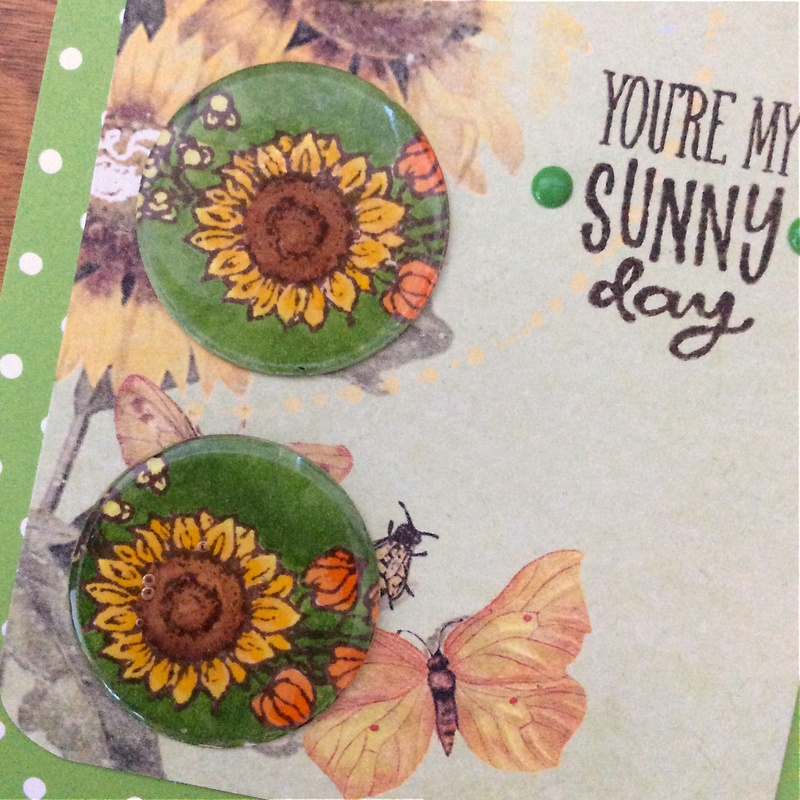 I was inspired by a cool pack of paper I found at The Stamp Addict’s annual garage sale, which features sunflowers, daisies and butterflies on backgrounds of greens and blues. I wanted to try a “sunken 3-D” effect, so I layered copic-colored sunflower sprays under a column of circles die cut from the patterned paper. While this paper had the requisite buttery yellows on a turquoise background, I repeated those two colors on my sunflowers and also added bright green berries. 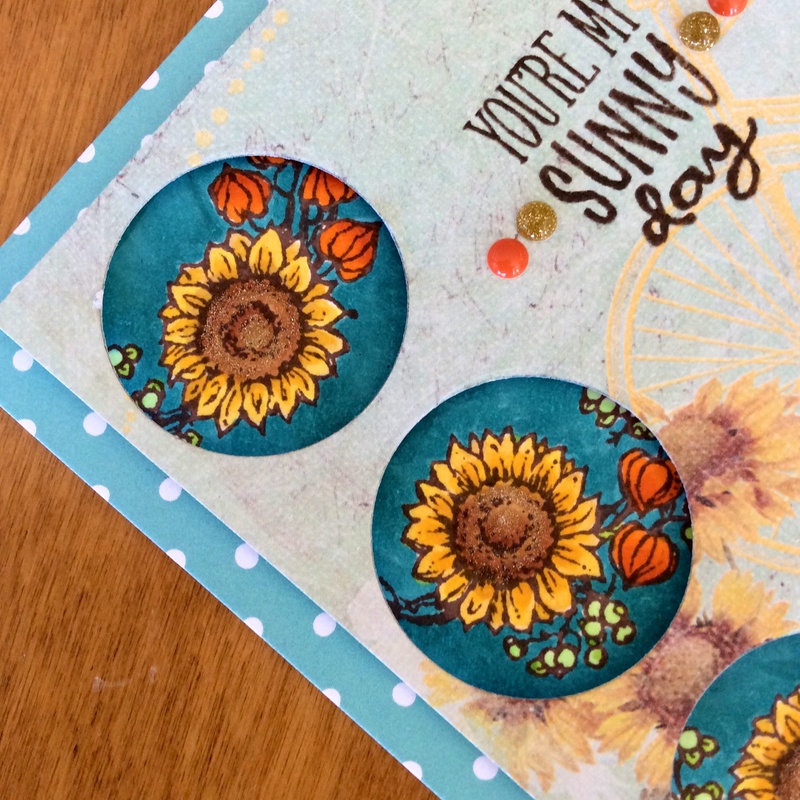 I used a sentiment from the Sunny Harvest set, and added some enamel dots from the My Mind’s Eye Market Street collection. I decided to repeat the gold sparkle from the enamel dots on the sunflowers with a swipe from a Wink of Stella gold pen. 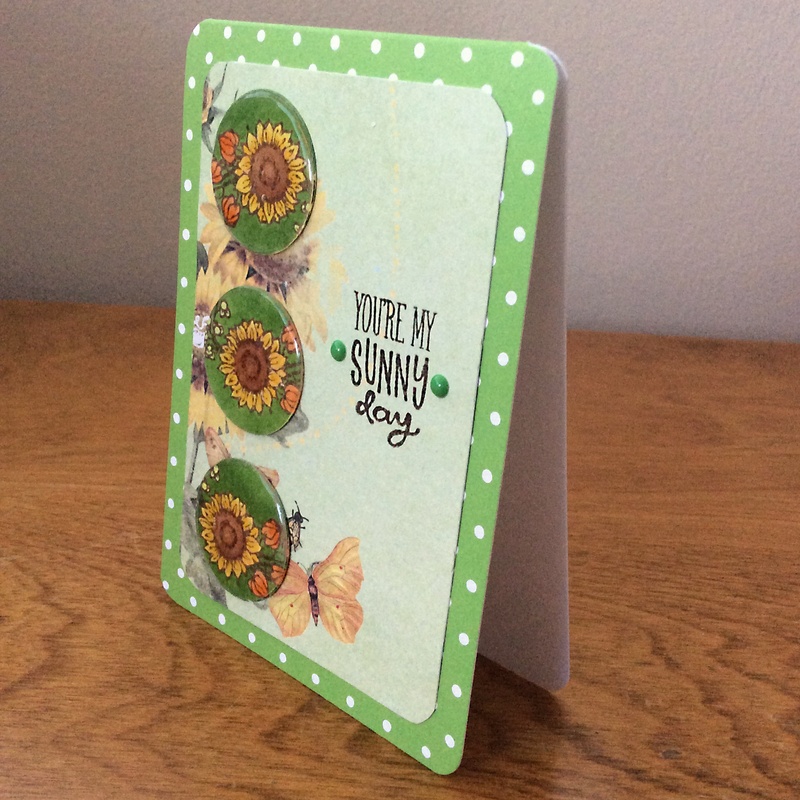 I thought a polka dot card base (Lawn Fawn) would add a whimsical touch, and then I went even further by die-cutting a ruffled edge on the bottom (also Lawn Fawn).